Very occasionally a group of people get together on the Touchedmix blog and post mixes on a particular theme. Last week, the theme was HEADS, with their features and their functions. 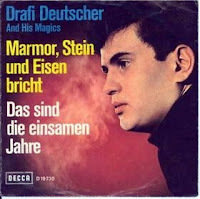 I thought readers of this little corner of the music blogosphere might be interested in the two mixes I banged together. Justine Washington is better known as Baby Washington; this is the original version of the song covered to good effect by Dusty Springfield. This time we look at the Carpenters hit that began life as an ad for a bank and was first released by a man with a one-off moniker; the Righteous Brothers classic which Phil Spector saw fit to issue only as a b-side; Gram Parsons’ famous song that was first recorded by a country singer before the co-writer had the chance; The Platters hit that was first an instrumental; and the Manhattan Transfer hit that was first recorded by a husband and wife team. Many thanks to Dennis, Walter and RH for their help. We’ve Only Just Begun first made its appearance in 1970 in a TV commercial for a bank (video), whence it was picked up by Richard Carpenter to create the popular wedding staple. 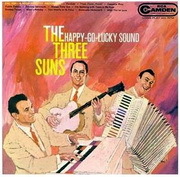 But before Richard and Karen got around to it, it was recorded a few months earlier by Freddie Allen, an actor who under his stage name Smokey Roberds was a member of ’60s California pop group The Parade, and later formed the duo Ian & Murray with fellow actor and Parade member Murray MacLeod. As Roberds tells it, one day he heard the Crocker National Bank commercial on his car radio (presumably the ad transcended media platforms), and recognised in the tune the signature of his composer friend Roger Nichols, who had written the ad’s song with lyricist Paul Williams. He phoned Nichols, ascertained that he had indeed co-written it, and asked him to create a full-length version. Nichols and Williams did so, and Roberds intended to produce it for a band he had just signed to White Whale Records. The deal fell through, so Roberds decided to record the song himself, but couldn’t do so under his stage name for contractual reasons. Since he was born Fred Allen Roberds, his Christian names provided his new, temporary moniker (see interview here, though you’ll go blind reading it). The remarkable Williams, incidentally, sang the song in the ad and would later write Rainy Days And Mondays and I Won’t Last A Day Without You for the Carpenters (both with Nichols), as well as Barbra Streisand’s Evergreen, Kermit the Frog’s The Rainbow Connection and the Love Boat theme, among others. Freddie Allen’s single, a likable country-pop affair, did well in California, but not nationally, which he attributed to promotion and distribution problems. 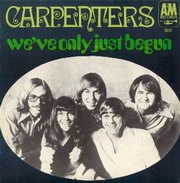 Released a few months later, the Carpenters had their third hit with We’ve Only Just Begun, reaching #2 in the US. 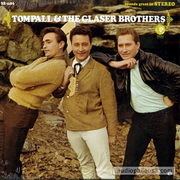 Tompall Glaser was one of the original country Outlaws, along with the likes of Waylon Jennings and Merle Haggard. With his brothers, he supported Johnny Cash on tour in the early 1960s before as Tompall & The Glaser Brothers they signed for MGM Records in 1966. The same year Tompall wrote Streets Of Baltimore, the sad story of a man who selflessly gives up everything, including his farm back in Tennessee, so as to fulfill his woman’s dream of living in Baltimore — with no happy ending, at not least for him. 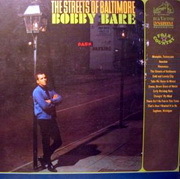 But the Glasers didn’t recorded the song first; Bobby Bare got there first. Recorded in April 1966 (produced by Chet Atkins) his version was released as a single in June 1966; the Glasers’ was recorded in September. Bare went on to have hit with it, reaching #7 on the Country charts. 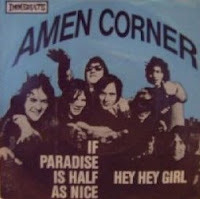 The song became more famous in the wonderful version by Gram Parsons, which appeared on his 1973 GP album. Likewise, the 1998 duet by the magnificent Nanci Griffiths and the awesome John Prine is essential. 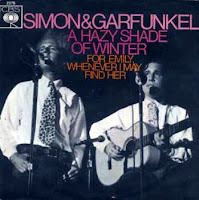 Dennis Glaser also said that the song has been mentioned in an American Literature textbook “as an example of songs that reflect actual life”. Not much seems to be known about the genesis of Twilight Time other than it becoming something of a signature tune for the group. They eventually recorded it in 1944. 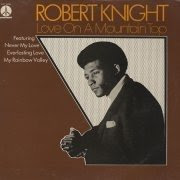 It had become so popular that songwriter Buck Ram put his evocative lyrics – “Heavenly shades of night are falling, it’s twilight time” – to the melody. 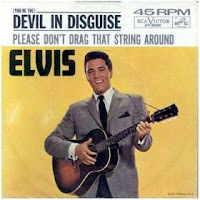 The first cover version of the song was recorded in November 1944 by bandleader Les Brown, and released in early 1945. But it is unclear whether it featured vocals. Several sources, including not always reliable Wikipedia, say that Brown’s version features Doris Day, and therefore is the first vocal version of the song. I’ve not been able to find the song or even proof that Doris Day sang it. 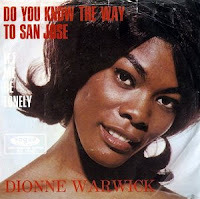 Featured here is the instrumental version Brown, released as the b-side to Sentimental Journey, the first recording of that standard which Doris did sing. A recording I have of an old radio programme of the Armed Forces Radio Service, called Personal Album, features five Les Brown songs. Four of them are sung by Doris Day, but when announcing Twilight Time, the presenter says that Doris will “sit that one out”. So I doubt she ever recorded it with Brown, though she might have sung it on stage. If Doris Day did not lend her vocals to Twilight Time, then the first recording to feature Buck Rams’ lyrics would probably be that released, also in 1945, by Jimmy Dorsey featuring Teddy Walters on the microphones, which appeared in the MGM movie Thrill Of A Romance. Alas, I have no recording of that version. 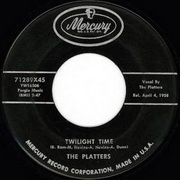 Twilight Time had been recorded intermittently — including a rather nice ragtime version by Johnny Maddox and the Rhythmasters — by the time Ram signed the vocal group The Platters, for whom he co-wrote some of their biggest hits, such as Only You and The Great Pretender. By 1958 it had been almost two years since The Platters had enjoyed a Top 10 hit. Ram dug out Twilight Time and his protegés had their third US #1. The song also reached #3 in Britain, their highest chart placing there until Smoke Gets In Your Eyes topped the UK charts later that year. Also recorded by: Roy Eldridge & His Orchestra (1944), Jimmy Dorsey Orchestra featuring Teddy Walters (1945), Johnny Maddox And The Rhythmasters (1953), Otto Brandenburg (1960), Billy J. Kramer & the Dakotas (1965), Billy Thorpe & the Aztecs (1965), Gene Pitney (1970), P.J. Proby (1973), José Feliciano (1975), Carl Mann (1976), Dave (as 5 Uhr früh, 1980), Willie Nelson (1988), John Fahey (1992), John Davidson (1999), The Alley Cats (2000), Anne Murray (2004) a.o. Few songs have irritated and fascinated me in such equal measures as Manhattan Transfer’s 1977 hit Chanson D’Amour, a UK #1. 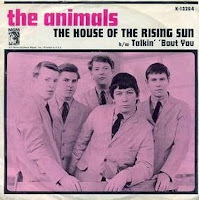 Their cover was ingratiatingly camp and absolutely ubiquitous, a middle-aged finger raised at punk. It is also a most insidious earworm. 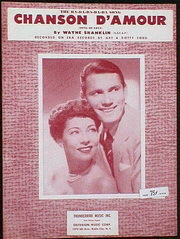 Almost two decades earlier, the Wayne Shanklin composition had been a US #6 hit for the husband and wife duo Art and Dottie Todd. The couple’s version competed in the charts with an alternative take by the Fontane Sisters. Ar and Dottie scored the bigger hit. It was also their only US hit. Chanson D’Amour didn’t chart in Britain, but the Todds had their solitary hit there with a different song, Broken Wings. 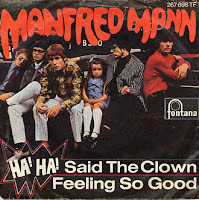 So they ended up one-hit wonders on both sides of the Atlantic, but with different songs. The Todds, who already had enjoyed a long career and even presented a radio show after getting married in 1941 (they met when accidentally booked into the same hotel room), proceeded to entertain in the lounges of Las Vegas for many years before their semi-retirement in 1980 to Hawaii, where they opened a supper club. Dottie died in 2000 at 87; Art followed her in 2007 at the age of 93. Somehow it seems right that this couple, who lived and worked together for six decades, should be remembered for a Song of Love. 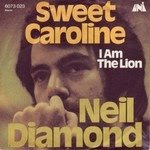 Chanson D’Amour was resurrected in 1966 by easy listening merchants The Lettermen, who had a minor US hit with it. And a decade later, Manhattan Transfer recorded their cover, adding a French 1920s cabaret feel to the Todd’s template, which they followed quite faithfully. Also recorded by: Also recorded by: The Fontane Sisters (1958), The Lettermen (1966), Gheorghe Zamfir (1974), Ray Conniff (1979), BZN (1981), André Rieu (2003), In-grid (2004) a.o. It takes something special to record a song that had been recorded many times and been a hit for various artists, and in the process appropriate it in the public consciousness. 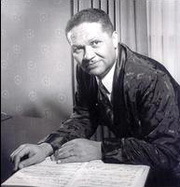 The Righteous Brothers did so with Unchained Melody, a song that made its public debut as a theme in the otherwise forgotten 1955 movie Unchained (hence the song’s cryptic title), sung on the soundtrack by the African-American singer Todd Duncan (pictured), the original Porgy in the 1935 production of Porgy & Bess, who died at 95 in 1998 (the last surviving original cast member, Anne Brown, who played Bess, died a few months ago at the age of 96). Duncan was also a professor of voice at Harvard. I’m afraid the poor quality clip I’m posting here is the best I could find (thanks to my friend Walter). The song was written by Alex North and Hy Zaret (whose mother knew him as William Starrat). The story goes that the young Hy, in an episode of unrequited love, had written the lyrics as a poem, which North set to music in 1936. The yet nameless song was offered to Bing Crosby, who turned it down. Thereafter it sat on the shelves until almost two decades later North was scoring Unchained, a prison drama, which in a small role featured the jazz legend Dexter Gordon, at the time jailed for heroin possession at the prison which served as the movie’s set. Unchained Melody received an Oscar nomination (Love Is A Many Splendored Thing won) — the first of 14 unsuccessful nominations for North, who eventually was given a lifetime achievement award. Duncan’s version went nowhere, but the song was a US top 10 hit for three artists in 1955: Les Baxter, in an instrumental version, and vocal interpretations by Al Hibbler and Roy Hamilton, with Hibbler’s becoming the best known version for the next decade. 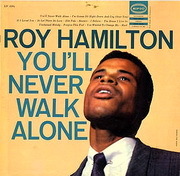 In June the same year, singer Jimmy Young took the song to the top of the British charts, the first of four times the song was a UK #1 (the other chart-toppers were the Righteous Brothers, Robson & Jerome, and Gareth Gates). 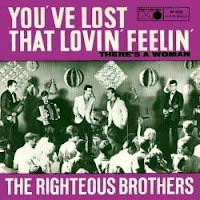 Ten years later, the Righteous Brothers’ recorded it, produced by Bill Medley (though some dispute that) with Bobby Hatfield’s magnificent vocals, and released on Spector’s Philles label. With so many versions preceding the Righteous Brothers’ take, one can only speculate which one, if any, provided the primary inspiration. 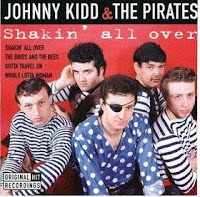 I would not be surprised to learn that Hatfield drew at least something from Gene Vincent’s vocals in the 1957 version, which oddly omits the chorus. As so often, the classic started out as a b-side, in this case to the Gerry Goffin & Carole King song Hung On You, which Spector produced. To Spector’s chagrin, DJs flipped the record and Unchained Melody (which had no producer credit on the label) became the big hit, reaching #4 in the US. In 1990 Unchained Melody enjoyed a massive revival thanks to the most famous scene in the film Ghost, featuring Patrick Swayze (R.I.P.) and Demi Moore playing with clay. 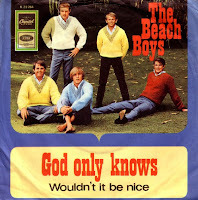 The song went to #1 in Britain, and would have done likewise in the US had there not been two Righteous Brothers’ versions in the charts at the same time. 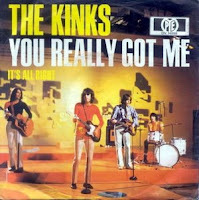 The owners of the 1965 recording underestimated the demand for the song and failed to re-issue it in large quantity. Medley and Hatfield took the gap by recording a new version, which sold very well. 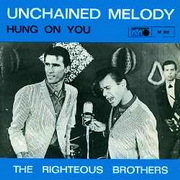 Since the US charts are based on sales and airplay, the 1965 version charted in the Top 10 on strength of the latter, while the reformed Righteous Brothers reached the Top 20. Unchained Melody represents another footnote in music history: it was the last (or second last, sources vary) song ever sung on stage by Elvis Presley. 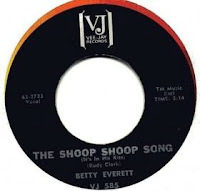 And fans of the Scorsese film GoodFellas may recognise the doo wop recording of the song by Vito and the Salutations. 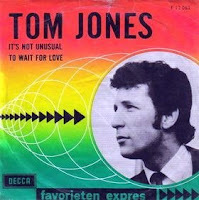 Also recorded by: June Valli (1955), Jimmy Young (1955), Cab Calloway (1955), Chet Atkins (1955), The Crew Cuts (1955), Harry Belafonte (1957), Gene Vincent and His Blue Caps (1957), Ricky Nelson (1958), Andy Williams (1959), Earl Bostic (1959), Sam Cooke (1960), The Blackwells (1960), Ray Conniff (1960), The Browns (1960), Charlie Rich (1960), Merri Gail (1960), Marty Robbins (1961), Cliff Richard (1961), Floyd Cramer (1962), Duane Eddy (1962), Conway Twitty (1962), Steve Alaimo (1962), Les Chaussettes Noires (as Les enchaînés, 1962), The Lettermen (1962), Frank Ifield (1963), Vito & the Salutations (1963), Johnny De Little (1963), Matt Monro (1964), Anne Murray (1964), Bobby Vinton (1964), Brenda Holloway (1964), Sonny & Cher (1965), Dionne Warwick (1965), The Wailers (1966), Patti LaBelle and the Bluebelles (1966), The Supremes (1966), The Englishmen (1967), The Caretakers (1967), Robert Gennari (1967), Igor Mann e I Gormanni (as Senza catene, 1968), Roy Orbison (1968), The Sweet Inspirations (1968), David Garrick (1968), Jimmy Scott (1969), The Platters (1969), Waylon Jennings (1970), The New Overlanders (1970), Dean Reed (1971), Blue Haze (1972), Al Green (1973), Donny Osmond (1973), James Last (1974), Bamses Venner (as En forunderlig melodi, 1975), Greyhound (1975), The Stylistics (1976), Kenny Rogers (1977), Paris Connection (1978), Willie Nelson (1978), Clem Curtis (1979), George Benson (1979), Heart (1980), Will Tura (as Oh My Love, 1980), Magazine 60 (1981), Gerry & The Pacemakers (1981), Joni Mitchell (1982), Bill Hurley (1982), Manhattan Transfer (1984), Leo Sayer (1985), U2 (1989), Maurice Jarre (1990), Ronnie McDowell (1991), Richard Clayderman (1992), Dread Zeppelin (1993), Captain & Tennille (1995), Michael Chapdelaine (1995), Al Green (1995), Clarence Gatemouth Brown (1995), Robson & Jerome (1995), Melanie (1996), Günther Neefs (1997), LeAnn Rimes (1997), Joe Lyn Turner (1997), David Osborne (1998), Neil Diamond (1998), Mythos ‘n DJ Cosmo (1999), Gareth Gates (2002), Justin Guarini (2003), Marshall & Alexander (2003), Bruno Cuomo (2003), Cyndi Lauper (2003), Jan Keizer (2004), Il Divo (2005), Joseph Williams (2006), Barry Manilow (2006), Damien Leith (2006), David Phelps (2008), Johnny Hallyday & Joss Stone (2008), Carrie Underwood (2008) a.o.